This is a Baseball Cake for a Little League end of the season party. Each tier is one layer of vanilla and one layer of chocolate with a vanilla buttercream frosting. All decorations are fondant or gumpaste. The best part was that the baseballs around the bottom tier had each player’s name and number and made a perfect slice for each one. The kids were thrilled! One of the kids was so impressed that everything was edible that he took a huge bite right out of the fondant bat, he said he liked it! Surely you are a professional cake decorator, right?? I am So impressed. 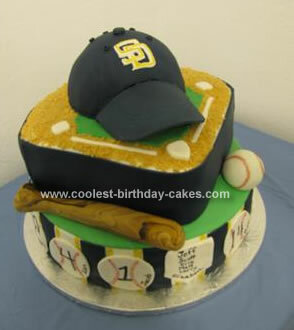 I am going to see if our local bakery can replicate it for my son’s b-day…but this time with a CUBS hat!!! Great job! !